Home History Did India Gain Independence On August 15th, 1947? Did India really gain independence on August 15th, 1947? The answer is no. 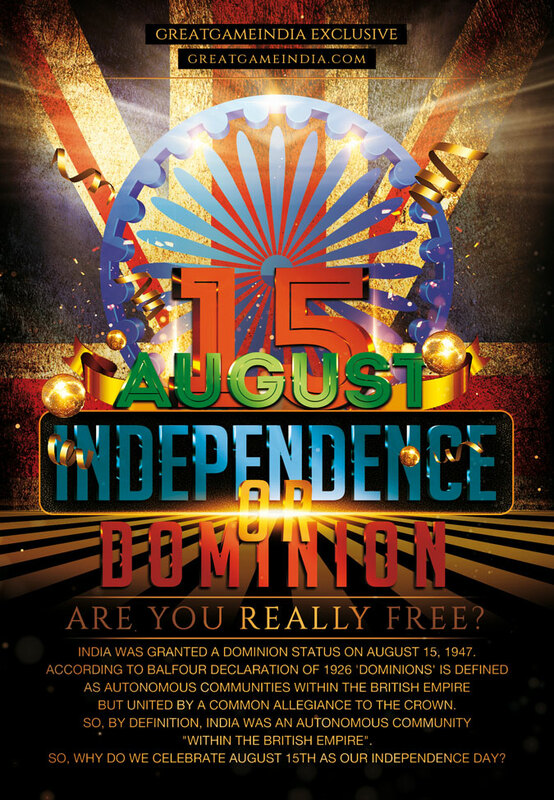 India was granted a dominion status on August 15, 1947, but we still unknowingly celebrate it as Indian Independence Day. Only on January 26th 1950 when India became a republic was the word Dominion replaced by Republic. India was granted a dominion status on August 15, 1947. According to Balfour Declaration of 1926 ‘dominions’ is defined as autonomous communities within the British Empire but united by a common allegiance to the Crown. So, by the definition, India was an autonomous community “within the British Empire”. So, why do we celebrate August 15th as our Indian Independence Day? Many people in India still believe that a Dominion status is equivalent to an absolute independent status. All those who so believe should go back to elementary school to re-learn their English. According to the Oxford dictionary, a ‘dominion’ is a country of the British Commonwealth having its own government. This same mistaken belief was also held by all Congress leaders in those days who openly proclaimed that there was no difference between dominion status and independence and accepted the dominion status in their all party conference of November 1929. This same confusion was furthered by the approval of dominion status in the Lahore Conference of 1929. But later Subhash Chandra Bose proposed that independence meant complete dissolution of any relationship with the British; for this he was labeled a terrorist and foreign agent. Only on January 26th 1950 when India became a republic was the word Dominion replaced by Republic. Still Indians ignorantly celebrate August 15th as Indian Independence Day. The British wanted to replace some provisions of the dominion status of India and Pakistan which were applicable to other dominion of British Crown, namely Canada, Australia, New Zealand, South Africa. India was called “Dominion of India” from 1947 to 1950. 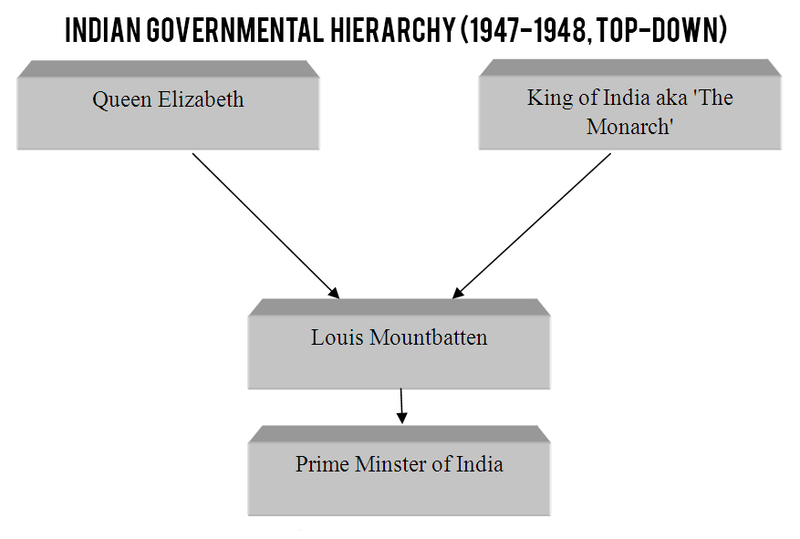 We never taught in our history books that India had an official King in George VI post independence and this type of government system that could be called ‘Constitutional Monarchy‘. After Indian Independence the monarchy of India was a system in which a hereditary monarch was the sovereign of India from 1947 to 1950. India shared the same person as it’s sovereign as the United Kingdom and the other Dominions in the British Commonwealth of Nations. The monarch’s constitutional roles were mostly carried out by the Governor-General. The royal succession was governed by the ‘Act of Settlement 1701’. In 1948 Mountbatten left his position by appointing C. Rajagopalachari. Even till 1950, then Prime Minister of India was only the fourth in command. By January 26th, 1950 we wrote our own Constitution, and abolished the monarchy. So, effectively Indian Independence Day was January 26, 1950, and not August 15, 1947. “Jawaharlal Nehru presents his humble duty to Your Majesty and has the honour to submit, for Your Majesty’s approval the proposal of Your Majesty’s, Ministers in the Dominion of India that Sri Rajagopalachari, Governor of West Bengal, be appointed to be the Governor General of India on the demission of that Office by His Excellency Rear Admiral the Earl Mountbatten of Burma…”. I, Jawaharlal Nehru, do solemnly affirm that I will be faithful and bear true allegiance to His Majesty, KING GEORGE THE SIXTH, Emperor of India, His Heirs, and Successors, according to law. I, Jawaharlal Nehru, do solemnly affirm that I will well and truly serve our Sovereign, KING GEORGE THE SIXTH, Emperor of India, in the Office of Member of the Governor General’s Executive Council, and that I will do right to all manner of people after the laws and usages of India without fear or favor of affection or ill-will. What about our Army, Navy and Air Force leadership? For any colonial nation, if independence means “not dependent” or not having to depend on anyone or anything else, it also means being strong and being able to survive alone. So, for India it means to see-off even the last British administrator from its land. We than would have to wait further until the late 1958 to celebrate ‘Independence’ because even after August 15th 1947, British officers Sirs Rob Lockhart and Roy Bucher were still heading the Indian Army and they left their positions in 1947 and 1949 respectively and World War veterans Sirs Edward Parry, Charles Pizey and Stephen Carlill were heading the Indian Navy until 1951, 1955, and 1958 respectively. At the same time World War veterans Sirs Ronald Ivelaw-Chapman and Gerald Gibbs were heading our Air Force until 1951 and 1954 respectively. It was only in 1954 that we could see one of our own citizens, Subroto Mukherjee, at the helm of the air force affairs. Mukherjee himself was a war veteran and a graduate from the prestigious Royal Air Force College, Cranwell. But history has it that he told Mountbatten that he would need five to seven years time to take up the charge of the Air Force and also the navy took a very long time of eleven years for the transition of control to an Indian. But then, how come the Army transition was over in just two years after our independence and that in the Navy took seven long years? Even Mukherjee, a winner of several decorations and awards from the mighty Queen, needed those seven years to rise to that level? He also had to undergo a course at the Imperial Defence College, London to shape himself up for the top post? After India saw ruthless rule of British for 250 years it would be foolish to think that they were under any sort of obligation to train us to the required level and ensure a smooth handshake. India became “Republic within Commonwealth on 1950”; now what is republic? Republic simply means ‘rule of law’ but note the word ‘within’; one cannot be free if they are ‘within’ other’s jurisdiction no matter how many constitutions we write. “People always keep saying to me: ‘Oh, you are the maker of the Constitution.’ My answer is I was a hack. What I was asked to do, I did much against my will. During the Second World War the Allies accepted a San Francisco Peace Treaty on September 8, 1951 which came into existence on April 28, 1952. That same day on April 28th, Independent India also issued a statement stating that the war between India and Japan has ended and we signed the separate ‘peace treaty’ called Treaty of Peace Between Japan and India on June 9, 1952 restoring relations between the two nations. What this signifies is that from September 1945 when Japan surrendered or from 15th August 1947 when we became Independent until June 9, 1952 India was officially in a state of war with Japan. What was the need for India to go to war with Japan after independence? Was the decision to declare war with Japan undertaken by independent India or was India fighting a proxy war? In that case who was in control of India’s foreign policy even after independence? What is the implication of such a thing? It should be kept in mind that Subhash Bose during the same period had made an alliance with Japan to eject the British from India and achieve complete freedom. Is this the reason why Bose was labeled a terrorist? India’s response to these events suggests that the leadership, and the populace at large, is as ignorant about the international equations as they were during the colonization of India. We have completely failed to understand the players in this game, their motives, their powers and their means. Further few Indians even today care to ask themselves questions that would lead them in the direction of these answers. While India has produced scientists and engineers of very high caliber, its failure to produce social scientists of even mediocre capability in understanding the political equations is surprising. Although our society has focused its efforts in producing a vast talent base of students trained to think with the precision of modern mathematics, it has abysmally failed to apply this precise thought to the social sciences. This has resulted in an utter failure to answer even the most elementary of questions in international politics. One cannot help but surmise that these engineers and scientists were perhaps encouraged to serve unseen masters who deliberately kept the society in dark about the social sciences themselves. It is natural for masters to keep their slave subjects from knowing too much about them. Even in the start of this new millennium few in Asia, and fewer in India in particular, have heard about the subject of Geopolitics. With most of the major players centered around Europe and the Middle East, it is no surprise that the Indians were kept ignorant about the deeper forces that drove the world for the past twenty centuries. In the best of cases, we have viewed these awful events with ignorance and what is worse, with a self-destructive arrogance. More often than not, we have chosen to bury our heads in the sand and refuse to view them at all. At the end of the day the brutal truth is ‘August 15th’ is not a day of celebration or a day of distributing chocolates or not even a day to feel that ‘We are free’. The fact is it is a day to feel sorrow and shame on ourselves to celebrate as Independence Day a major event that triggered the riots which preceded the partition in the Punjab region that killed between 200,000 and 500,000 people in retributive genocide between the religions due to the evil policy of divide and rule by British. UNHCR estimates 14 million Hindus, Sikhs and Muslims were displaced during the partition; it was the largest mass migration in human history. – Patrick Henry, 1775, fire brand Patriot urging his fellow Virginians to fight against East India Company’s British oppression in todays USA. 2. The London Gazette: no. 38330. p. 3647. 22 June 1948. Retrieved 25 August 2014. Royal Proclamation of 22 June 1948, made in accordance with the Indian Independence Act 1947, 10 & 11 GEO. 6. CH. 30. (‘Section 7: …(2)The assent of the Parliament of the United Kingdom is hereby given to the omission from the Royal Style and Titles of the words ” Indiae Imperator ” and the words ” Emperor of India ” and to the issue by His Majesty for that purpose of His Royal Proclamation under the Great Seal of the Realm.’). According to this Royal Proclamation, the King retained the Style and Titles ‘George VI by the Grace of God, of Great Britain, Ireland and the British Dominions beyond the Seas King, Defender of the Faith’, and he thus remained King of the various Dominions, including India and Pakistan, though these two (and others) eventually chose to abandon their monarchies and became republics. 9. “The London Declaration of the Commonwealth Prime Ministers, April 28, 1949”. de Smith, S.A. (July 1949). The Modern Law Review 12 (3): pp. 351–4.